Law Day is a national event originated by the Canadian Bar Association (CBA). First held in 1983, Law Day celebrates the signing of the Canadian Charter of Rights and Freedoms. Law Day aims to educate and inform the public about the role and importance of the law. 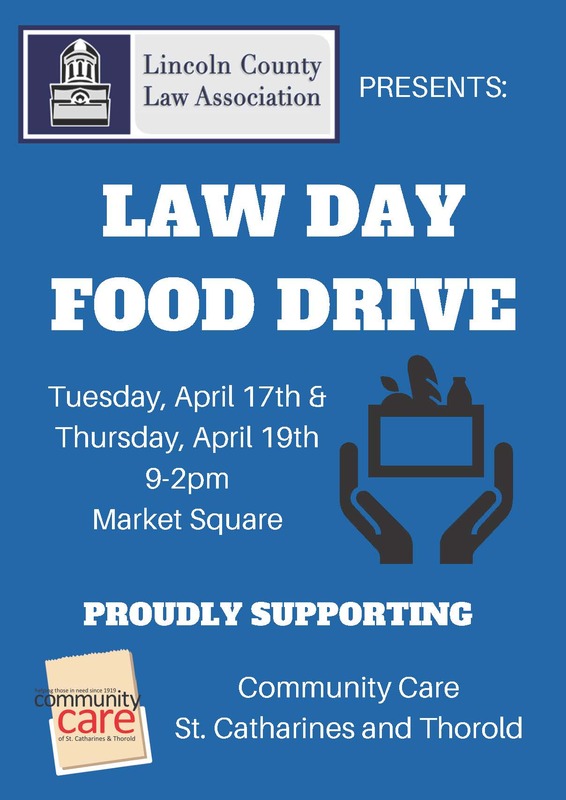 The LCLA chooses to mark the occasion of Law Day by holding a food drive in support of Community Care of St. Catharines and Thorold. Come on down to Market Square in St. Catharines from 8:00am – 2:00pm on Tuesday April 16th and Thursday April 18th to make your donations. The Law Day Food Drive Challenge will have two categories, one for law firms and one for sole practitioners or in-house counsel from businesses in the region. The winners in each category will have their names engraved on the Food Drive Trophy and will get to display the trophy at their business for the next year. 2019 marks the 100th anniversary of operations for Community Care of St. Catharines and Thorold. Help us contribute to the incredible work they do throughout our community by giving to the Law Day Food Drive. If you have any questions about the Law Day Food Drive, please contact our associate lawyer and LCLA Board Member Karen Shedden. Daniel & Partners LLP wins Community Care Food Drive Challenge! Bail Robert & Matt Out!